This almost turned my stomach. 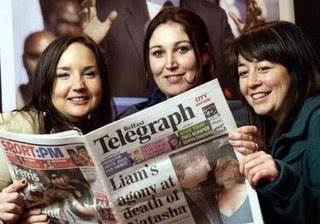 You go to do a photoshoot for the Belfast Telegraph. You realise that the coverstory is not something that will promote good feelings (I really hope they noticed!). So what do you do? Call someone and get them to mock up something that could be stuck over the front cover? Get yesterday's cover? No, if you're the Belfast Telegraph you just push ahead. Bad move guys. Very bad move.